Finding crafts for tweens and teens that are age-appropriate and entertaining isn’t as easy as it sounds. 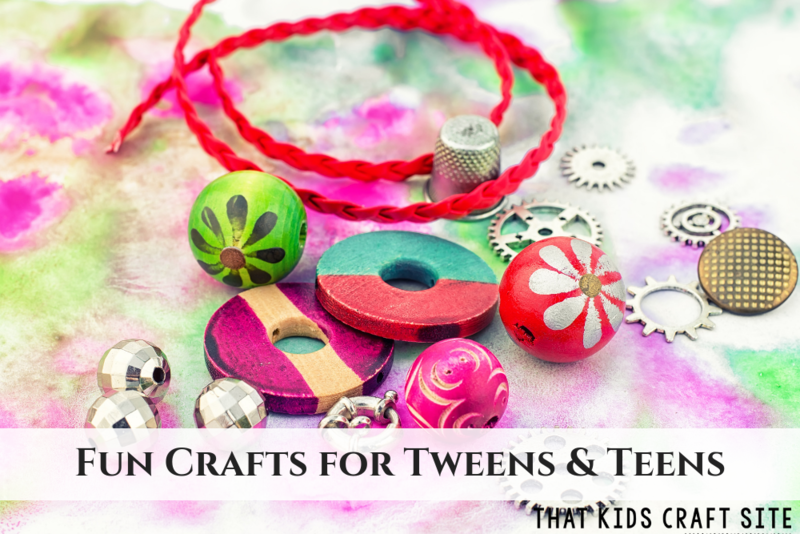 Thankfully, these fun crafts for tweens fit the bill! As a mom to two teenagers and a tween, I know first hand how challenging it can be to find the perfect craft. 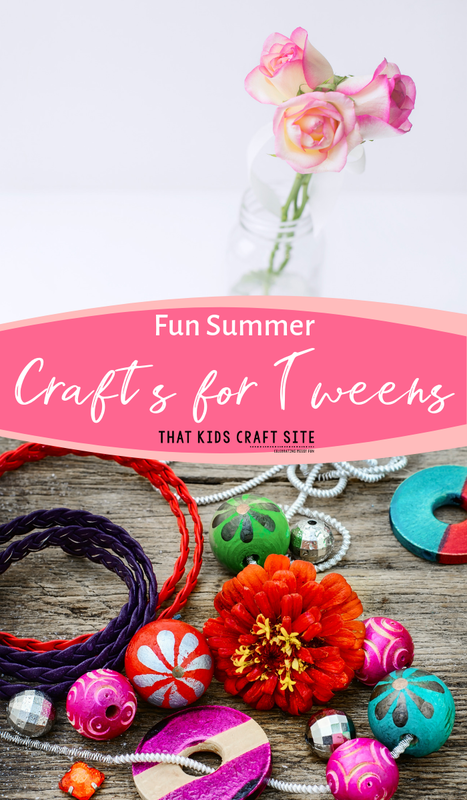 Whether we’re looking for an activity for a group or class or something that Little Miss wants to do on her own, finding a craft that keeps her entertained and isn’t too “babyish” is a real challenge. After we made these awesome Diffuser Bracelets (a perfect craft for tweens and teens, I might add! ), we set off on a mission to find even more tween crafting goodness. Here are some of our favorite fun crafts for tweens that are great for summer activities (or camp!) or on rainy days. Let’s be honest – there’s really no bad time to be crafting as far as we’re concerned! Wash and dry the bottle. If there’s a label on it, soak it in warm water to remove. Paint all sorts of designs on the outside of the bottle. Decorate it with as much or as little paint as you wish. Bake the bottle – now a bud vase – according to the directions on the paint bottles. This is an important step because it helps keep the paint from chipping off. If you’re using decorative items, glue them to the bottle after it has been baked and has completely cooled off. Instead of a glue gun, use white (or clear) school glue. Coat the outside of the bottle with glue (use a paintbrush for easy application) and roll the bottle in a tray of small beads. Use a decoupage medium (like this one) and magazine cut-outs to decorate the bottle. You can also use a colored glass bottle if you have one. My daughter loves making keepsake boxes for her special treasures and this is one of the easiest DIY crafts for tweens around! Choose images, words, and sayings from the magazines and catalogs that appeal to you. Cut them out. Decide where you’d like the cut-out pieces to go on the box. Apply the decoupage medium to the box and place your pictures and sayings in the design of your choice. Put a thin layer of the decoupage medium over the cut-outs to secure and protect them. After the box dries, use it to store summer memories, school mementos, or some of your favorite things. There are lots of ways to make necklaces, but one of the easiest and most creative ways is simply with thread and beads. Here’s how to make them. Lay out the design with the beads before you start to string them. If you want a central pendant as a focal point, be sure to lay that out first and make sure the beads on each side are symmetrical. Thread the needle with upholstery thread to your desired length. Make sure it’s long enough to go around the neck and has plenty of room for the clasps or to be tied off. Begin to string the beads in order by sticking the needle through the center of the beads. Don’t forget to start with the end beads, not the center one(s)! If you are using seed beads to space between larger beads, be sure to count each one so the spacing is even. If some beads are too small to fit over the needle, use the pliers to coax them over. When finished, tie the threads off in several square knots or attach the necklace clasps. Show Us Your Fun Crafts for Tweens! Did you make one of the crafts for tweens above? Show us! Snap a picture and tag us on Instagram @ThatKidsCraftSite! We can’t wait to celebrate your creativity!